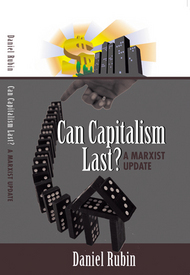 Book review: Can capitalism last? “Marxism is dead. Socialism is dead. What better proof than the collapse of the Soviet Union? What better proof than the collapse of the socialist countries in Eastern Europe? What better proof than the apparent return of at least many features of capitalism in China and Vietnam? Socialism might be a nice ideal but it doesn’t work in the real world. The fact that socialism is gaining many adherents today in Latin America, Asia and other continents doesn’t really mean much. They’ll end up just like the other countries where socialism collapsed. In any case, socialism really doesn’t have any value for workers in the United States today. It has nothing to offer in their fight for a better life.” That, in short, is the essence of what capitalists today have to say about socialism. They have very little to say, however, about how we can solve the great social problems of our time. Communists in the United States say that the social problems of our time cannot be solved by capitalism and that socialism is, in fact, more of a necessity today than it ever was before. They also say that this makes understanding the fundamentals of Marxism from the perspective of the U.S. experience more important than ever. Perhaps the biggest impediment to this understanding is that there has been a paucity of books by American Communist writers that lays bare the fundamentals of Marxism from the U.S. perspective. The last such attempts from other countries (Britain and the Soviet Union, for example) were made between 1950 and 1960. All that has changed now with the publication of Daniel Rubin’s “Can Capitalism Last – a Marxist Update.” Rubin is the author of several works on Marxist theory and is a member of the national board of the Communist Party USA. Rubin’s book examines the main aspects of Marxism and shows how critical they are to the struggles for progress we witness every day. His book manages to cover all the major aspects of Marxism in a 196-page volume along with updating some concepts. He manages to take the fundamentals of Marxism, build upon them and apply the methodology to the new developments of our day. Hard to believe? Well, in this case, reading is believing. For those who already profess to be Marxists, Rubin pulls together the most important subjects of Marxism in clear, simple fashion and makes major applications to U.S. circumstances. His description of the current period of history, for example, is outstanding. He shows how proper use of Marxist methodology and tools brings us to an assessment of this period as the “transnational monopoly phase of the monopoly capitalist stage of imperialism.” He updates Marxism. In so doing he considers and gives full credit to the achievements of the world Communist movement in the Soviet Union, Cuba, China and other places while also discussing the failures and inadequacies in both theory and practice during the Stalin period and in the collapse of socialist countries. He catches everyone who has ever read a book on the fundamentals of Marxism completely off guard by turning on its head the way all other books present this subject matter. Books on the fundamentals of Marxism almost always begin with the most general and then discuss the more particular. The typical approach is to start with the most universal of objective processes – dialectical materialism (which, by the way, he fully explains in this book), then historical materialism and then political economy. The typical such book only then goes on to the more subjective issues: identifying the forces for progress, the strategies and tactics needed to move forward and then, last, socialism and what it takes to win it. Rubin, however, begins where most people begin. He starts with the huge social problems people face. He defines the great problems of our day and then asks and, in a systematic Marxist manner, answers questions like: Are these problems inherent in capitalism? Can they be eliminated from capitalism, or at least ameliorated while Capitalism is still in existence? If they cannot be eliminated does it mean capitalism is doomed? If so, then what will follow? Is it socialism or can it be something else? Can socialism create the conditions for solving the social problems? If so, how do we win socialism? Who has to do what for it to come about? Where does the Communist Party fit into the picture? Ask for the book at your local library or bookstore, or order it directly from the publisher at this link .